Rangers' Club, Yosemite NP, 1985. The Rangers' Club is a two-and-a-half story wood frame structure with a granite rubble foundation. The building is U-shaped in plan with a small courtyard on the inside of the "U.". Exterior walls are finished with redwood shingles with the exception of the gable ends which are board-and-batten vertical siding. The building is stained brown with a gold-ochre trim painted around window frames. All of the corners of the building are edged with peeled log pilasters that run from the foundation to the eaves. A wood terrace centered on the south elevation is flanked by bay windows at its east and west edges. The corners of the bays and the terrace are also edged with peeled logs, like the other building corners. The log pilasters on the corners originally extended through the roof. The extending portions were cut back to the roofline by 1932. All of the gable ends of the building have second-story balconies. The balconies have jigsawn railings, reminiscent of chalet buildings. Decorative jigsaw work is repeated in the lower portions of the board-and-batten siding at the gable ends, in the attic vents, and in the fine interior woodwork. Fire escapes of wood planks and log railings were added at the north end balconies of the wings in 1947. Wood ladders on the east and west gables were probably added at the same time. The roofs are steeply pitched and contribute a substantial amount to the building's character. The roofs are finished with wood shingles and are pierced by multiple dormers that increase the interior space and provide additional light to the second-story rooms. Dormers in the south (main) wing have shed roofs. Those on the east and west wings have gable roofs on the outside portions of the "U" and shed roofs on the inside portions of the "U." A massive granite chimney is centered on the north wall of the courtyard. The rooms retain their original configurations. The most important interior spaces are the common rooms on the first floor--the dining room, living room, and the north and south nooks off the small connecting hallway between them. The nooks are defined by bookshelves that rise halfway to the ceiling and that partition off that intermediate space between the living room and dining room. The backboards of the bookcases have fir tree designs sawn into the wood. Wood posts and pilasters along the walls of the dining room and living room and edging the bookcases are chamfered, with sawn corbel capitals. The posts support composite beams that have chevron-patterned trim on their lower edges. Hewn ceiling joists above the beams support the rough wood ceiling, laid in a diagonal pattern. The carved portion of the chevron and the ceiling boards have a light-colored stain finish, which contrasts with the dark beams, joists, and wall paneling, and emphasizes the zig-zag of the chevron and the strong lines of the ceiling joists. The ornamental designs of forest, alpine, and Indian cultural elements add a quality of rusticity to the space. All of these spaces have a wall treatment of a dark, wood-paneled wainscoting with a plaster finish above. This treatment is repeated throughout the hallways of the building. The walls of the staircases to the second floor have a dark wood paneling. Twelve-light french doors provide access from the living room to the wood terrace at the south side of the building. Original furnishings remain in the dining room and main living room. These include trestle tables and benches of four-inch thick sequoia planks. A wagon-wheel chandelier hangs in the living room, centered in front of the fireplace. Small lamps with leather shades are on the posts and walls of the common spaces. The nooks each have ceiling lamps hanging above the tables; the lamps sport a fringe made of giant sequoia cones. Most of the rooms have kept the original wood-dowel curtain rods. A bronze plaque commemorating Stephen T. Mather, first director of the National Park Service, is to the left of the fireplace. A painting of Mather is directly over the granite fireplace. The second story has a U-shaped hallway with single and dormitory rooms, and shared baths along its outside edges. Some of the single rooms have their own baths. The partial basement houses laundry facilities and mechanical equipment. The walls of the staircase down into the basement are finished with beaded siding. Floors throughout the building are wood, with the exception of the concrete floor in the partial basement. The wood floors are covered with large rugs in the common rooms and are covered with linoleum in the kitchen and bathrooms. The kitchen area and bathrooms throughout the building have been updated with new materials. A ramped entrance was added to the northeast (kitchen) wing to accommodate employees in wheelchairs. Considerable preservation work was done on the south elevation of the structure including jacking up the building, rebuilding part of the foundation, and replacing wood, to counteract rot and subsidence. All of this work was completed approximately ten years ago. A fire detection and suppression system was added to the building. The men's dormitory section has new partitions that were added in 1979 so that occupants could have more privacy. The original heating system was electric but was abandoned in 1933 when steam heat was installed. The building's present electric baseboard heat was installed prior to 1973. To the east of the Rangers' Club is the garage-woodshed that was constructed to match the Club. The building is L-shaped in plan, with steeply pitched gable roofs, shingle siding, and board-and-batten gable ends. To the west is a small wood-frame transformer house, also constructed with similar features. Only the exterior of these additional structures are included as part of this landmark nomination. The Rangers' Club in Yosemite Valley was donated to the National Park Service by its first director, Stephen Tyng Mather. The building is representative of his commitment to an architectural aesthetic appropriate for the park lands that he was charged to manage. The foundations of that aesthetic that he and others formulated guided the design of park buildings through World War II. As noted in the National Register form, the Rangers' Club is also of regional historical significance in the category of conservation through its connection with the first director of the National Park Service and through its integrity of function as the residence for unmarried rangers. Stephen Mather was brought into the Department of the Interior in 1915 by Secretary of the Interior Franklin Lane to promote the concept of establishing a park bureau. Mather's background and training as a wealthy borax promoter and avid conservationist met the criteria Lane needed--someone who had strong public relations abilities while at the same time had a sincere interest in conservation. The American Civic Association and the American Society of Landscape Architects (A.S.L.A.) had both been pushing for a park bureau that would emphasize a level of professional expertise in landscape architecture. During the summer of 1916, just before the creation of the National Park Service, Mather even invited A.S.L.A. members to visit various parks and make recommendations for development and improvement. This was just one of a series of contacts between the Department of the Interior and A.S.L.A. When the new bureau's emphasis on appropriate design came out in the first "Statement of Policy" that Mather issued in 1918, the influence of the A.S.L.A. was evident. It stated: "In the construction of roads, trails, buildings, and other improvements, particular attention must be devoted always to the harmonizing of these improvements with the landscape. This is a most important item in our programs...and requires the employment of trained engineers who either possess a knowledge of landscape architecture or have a proper appreciation of the esthetic value of park lands." This statement was the foundation of the rustic architecture that followed. Mather's love affair with Yosemite began before his employment with the Department of the Interior. As director of the new agency one of his early decisions was to move the development of Yosemite Valley from the south side to the north. Included in the new development he proposed were a museum, post office, and headquarters building. In conjunction with that development Mather saw the need for a special structure to house members of his newly organized ranger force. The withdrawal of Army troops (with the exception of Army Engineers) from park areas and the burgeoning tourist industry created the perfect situation for Mather to proceed with his ideas for employing park rangers who could guide tourists and answer their questions as well as arrest poachers and vandals. As a donation to the National Park Service, Mather hired the architect and had the structure built at his own expense to house members of that force. Sumner designed a fine structure--a large, rustic, modified chalet with wood shingles and board-and-batten siding, and steeply pitched roofs. Instead of leaving simple corners, every edge of the building was defined with heavy log pilasters, strengthening the connection between the building and surrounding forest edges. The steep roofs shed the winter snows and emphasized the structure's verticality. The natural materials further harmonized the building with its setting while the decorative railings on the balconies and terrace evoked images of European chalet precedents. On the interior the common spaces were treated with an Arts-and-Crafts warmth--stout wood furnishings, dark wood paneling, built-in bookcases with the added touch of jigsawn fir trees in the woodwork, wagon-wheel and cone-fringed chandeliers, exposed beams with chevron designs. The building suggested a sense of wilderness in form and design, tempered with allusions to frontier and alpine traditions. Mather did succeed in moving the development center of the Yosemite Valley to the north side of the valley, and the Ranger's Club was the first of the major structures built there. For the most part the building's type of rustic chalet design was not followed in future park architecture, but it did succeed as an inspiration for a wide range of variations in rustic design. The building's strong rustic character and intimate connection with the first director of the National Park Service make it unique in the National Parks. 1. 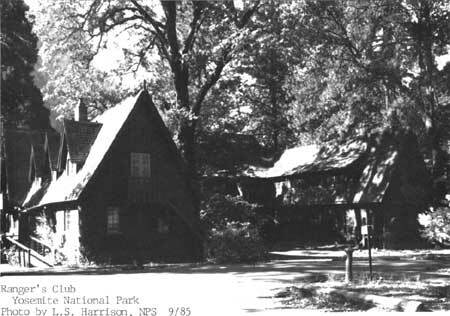 William C. Tweed, Laura E. Soulliere, and Henry G. Law, National Park Service Rustic Architecture: 1916-1942 (San Francisco: National Park Service, 1977), p. 23. 2. Letter of Horace M. Albright to William C. Tweed, June 4, 1976. Ise, John. Our National Park Policy: A Critical History. Baltimore: Johns Hopkins Press, for Resources for the Future, 1961. LaFleur, Harold. Historic Structure Report: Rangers' Club, Yosemite National Park, California. Denver: National Park Service, Denver Service Center, September, 1973. Letter of Horace M. Albright to William C. Tweed, June 4, 1976. Tweed, William C., Soulliere, Laura E., and Law, Henry G. National Park Service Rustic Architecture: 1916-1942. San Francisco: National Park Service, 1977. The landmark boundary is shown as the dotted line on the attached park planning map (omitted from on-line edition) beginning at a point on the south side of the access road (bus route) 50' east of eastern edge of the existing Rangers' Club parking lot proceeding in a south-southeasterly dirction to the northern edge at the highway, then proceediing in a westerly direction to the northern edge at the highway, then proceeding in a westerly direction along the edge of the highway 500', then proceeding north to a point on the access road (bus route) directly south of the Center intersection of the administration road and the access road then east to the starting point. 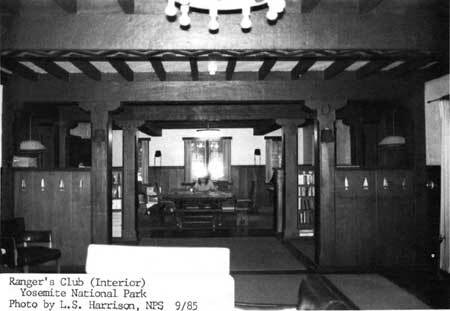 Rangers' Club (interior), Yosemite NP, 1985.